I recently read a blog from the Institute for Healthcare Improvement titled, Trying to Improve Patient Experience? Don’t Chase “Random Acts of Goodness”. The article inspired me to think about why the Patient Experience (PX) initiatives have required “buy-in” from employees. My assumption has long been that for those who choose to work at a hospital in any position, being kind, courteous, considerate, and respectful to the patients and their families was a bottom line requirement. This is the overwhelming nature of the patient experience: it is everything and everyone. It informs and re-informs patients about their future and then influences whether the future is worth living, whether the integrity and intact-ness of each patient survives a serious illness. The Beryl Institute has pushed past the patient experience to identify the human experience as the gold standard, collapsing the walls of the silo of the patient experience. 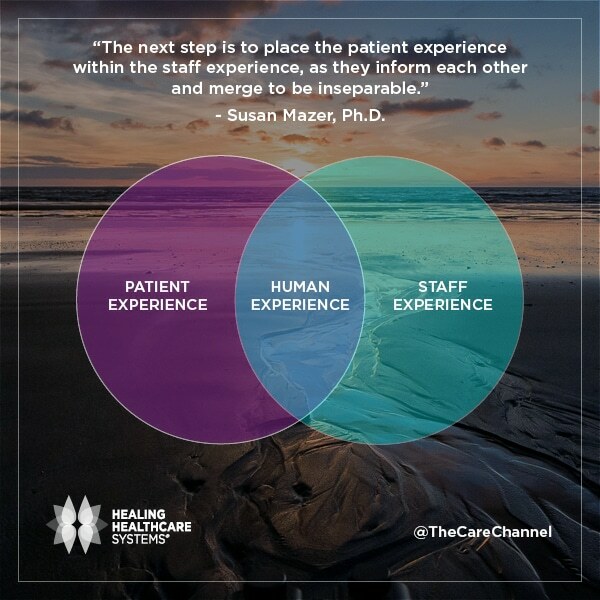 The next step is to place the patient experience within the staff experience, as they inform each other and merge to be inseparable. The Patient Experience is not merely a line item in a budget or a department or a ‘best practice’. Actually, it is the whole budget, the whole organization, and everything that happens. For every patient, their experience begins long before they enter the hospital and continues long after. “What if The Patient Experience had neither a start or end date?” We were not there when the patient experience started and will not be there when it ends, if it does. We have but a brief and critical time to influence the lives of those we care for.